This nTIDE release, the third in a series focusing on employment and the media, features programs based on the power of storytelling. The creative arts and media provide effective means of artistic expression for people with disabilities as well as sources for job training and employment. Each nTIDE release is followed by a Lunch & Learn webinar at 12:00 pm ET; register at http://www.ResearchonDisability.org/nTIDE. The labor force participation rate for working-age people with disabilities decreased from 34.8 percent in March 2018 to 34.2 percent in March 2019 (down 1.7 percent or 0.6 percentage points). 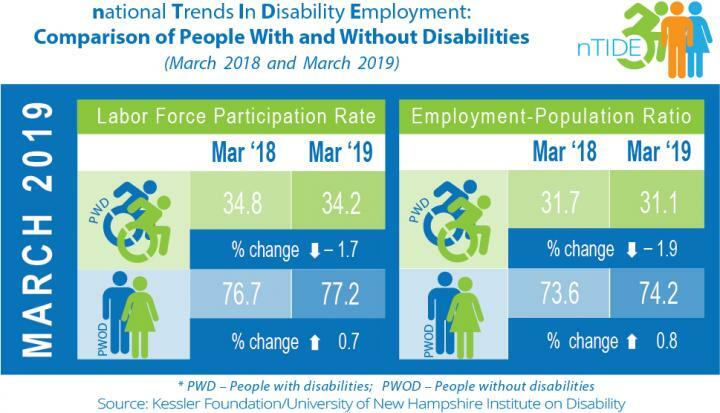 For working-age people without disabilities, the labor force participation rate also increased from 76.7 percent in March 2018 to 77.2 percent in March 2019 (up 0.7 percent or 0.5 percentage points). The labor force participation rate is the percentage of the population that is working or actively looking for work. Visit the nTIDE archives to learn about these programs that promote employment in media and entertainment – Lights Camera Access 2.0 presented by Tari Hartman Squire, and Inclusion Films by Joey Travolta https://researchondisability.org/home/ntide. Each nTIDE release is followed by a Lunch & Learn webinar at 12:00 pm Eastern. This live broadcast, hosted via Zoom Webinar, offers attendees Q&A on the latest nTIDE findings, provides news and updates from the field, as well as invited panelists to discuss current disability-related findings and events. On April 5, Anna Letitia Zivarts, Program Director of Rooted in Rights, joins Dr. Houtenville, Dr. O’Neill, and Denise Rozell, Policy Strategist at AUCD. Join live or watch the recordings at: http://www.ResearchonDisability.org/nTIDE.